"Only death awaits you all. But do not fear. For it is through death that new spirit energy is born. Soon, you will live again as a part of me." Sephiroth is the main villain of Final Fantasy VII, and the seventh Final Fantasy villain to be introduced in Domus Facina. He made his first appearance in Episode 0005, but wasn't officially introduced until Episode 0010. 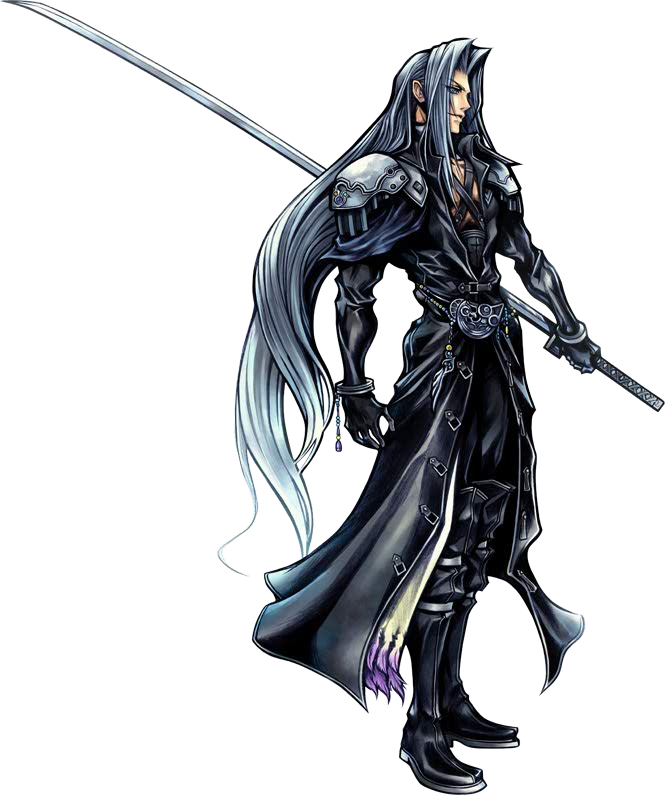 Sephiroth's design was based almost entirely on his Dissidia design, with the exception of his bangs, which were based on those of his original Nomura art. Sephiroth has long silver hair, and sports a black, leather trenchcoat. He also sports silver pauldrons on his shoulders, black, leather pants, and knee-high black boots. He wears an abdomen guard portraying the SOLDIER logo, with brown belts crossing his chest. He has a single, black angel wing on his right shoulder, which is retractable. Sephiroth is a very cold person. A little arrogant, he has a very teacher-like aura about him. This doesn't stop him from joking around with people, though. He can be a bit obsessive sometimes, hardly ever shows anger, and NEVER shows fear. He is easily annoyed, however. Sephiroth's weapon is the Masamune, a long katana whose legends state that only the pure of heart may wield it. Of course, calling it THE Masamune could be stretching it, as Sephiroth has been seen with many different swords all called the Masamune. Whether they are replicas or metamorphoses of the same sword is unknown, though its lengths vary from 4.5 to 12 ft. In the image above, it is 6 ft.
A Sage/Samurai. Yoshinori Kitase, producer of Final Fantasy VII: Advent Children, has stated that "Sephiroth's existence and will is extremely powerful. There is nothing stronger, nothing above him." Whether this only holds true in the world of FF7 or in the entirety of all fiction is unknown, but Sephiroth's list of abilities is indeed a sight. His skill with his sword is so perfect, that one slash to the human eye can be dozens of slashes in reality. These sword swipes have an accuracy so precise, that they can cleanly cut through any material multiple times in succession. He can concentrate his bodies' electrons into energy and fire them at his opponents in the form of slashwaves. He can fly, teleport, change his shape as well as the shape of JENOVA's body, and communicate telepathically. He can levitate people and objects, read minds*, project illusions, control the Lifestream, summon meteorites, pillars of fire, and orbs of dark energy. His skillset includes moves like Sephiroth Shock, Firaga, Blizzaga, Thundaga, Graviga, Quakega, Aurora Fence, Heartless Angel, Bizarro Energy, Slow, Stop, Havoc Wing, Pale Horse, Deen, Wall, Shadow Flare, Dispel, Break, Octaslash, Hell's Gate, Reaper, Fervent Blow, Sudden Cruelty, Oblivion, Godspeed, Scintilla, Heaven's Light, Stigma, Omnislash, Flash, and Meteor. And finally, his ultimate attack is Super Nova, in which he summons a comet from outside the galaxy to absorb the powers of the planets and collide with the sun. The energy from this collision is then concentrated into the beings of his opponents. *His ability to do this has been negated in Domus Facina, as having it could interfere with some plot elements. Born to Professor Hojo and Lucrecia Crescent, Sephiroth was the result of his father’s twisted experiments. While still in his mother’s womb he was infused with the DNA of an alien entity known as “JENOVA” which had been discovered by Shinra, a power company and Hojo’s employers, years earlier. Sephiroth was raised under the belief that JENOVA was his mother who had died giving birth to him. He joined SOLDIER, Shinra’s elite military force, and became a 1st Class. He was a well respected warrior with formidable power. In his time with SOLDIER, he made friends with two other 1st classes, Genesis Rhapsodos and Angeal Hewley. All three were well-respected members of SOLDIER. However, a number of years before Final Fantasy VII, a series of events took place which caused Genesis and Angeal to defect, thus labeling themselves as enemies of Shinra. These series of events would later lead to the death of Angeal and the supposed death of Genesis. Years later, Sephiroth was sent on a mission to a town called Nibelheim with another 1st named Zack Fair. They were to find the cause of a recent monster outbreak and put a stop to it. They went to inspect a broken Mako Reactor in the town’s vicinity. An infantryman by the name of Cloud Strife, whose hometown was Nibelheim, also accompanied them. When they got to the reactor, they discover more of Hojo’s sick experiments. Upon this gruesome discovery, Genesis appears to tell Sephiroth the truth of his past. This confuses Sephiroth, so he locks himself in the basement of the Shinra mansion located in Nibelheim where countless research records are stored. He discovers the truth of his birth for himself, which causes him to chase after his “mother” JENOVA to fulfill what he believed to be his destiny after burning down the entire village. He went to take his “mother” from the reactor, but Cloud impaled him through the back with Zack’s(formerly Angeal’s) Buster Sword before he could get any further. Sephiroth then decapitated his ”mother” and took her dismembered head with him as he sought revenge. He managed to impale Cloud, but Cloud used that as an opportunity to toss Sephiroth into the Lifestream below. Now, any normal person would have dissolved into the Lifestream, their body returning to the planet. But Sephiroth, by sheer willpower alone, stayed alive. Absorbing all knowledge of anyone who had died before. He spent five years learning everything that is known. He eventually found himself at the Northern Crater, where JENOVA had crashed into the planet some thousands of years earlier. From here he controlled JENOVA, whose appearance he had changed to mirror his own, to carry out his plan. He started by breaking JENOVA out of the Shinra HQ then mercilessly killing anyone who crossed his path, including the Shinra president. He then headed for his next destination, Nibelheim, along the way effortlessly slaying a Midgar Zolom. To get to Nibelheim, Sephiroth snuck onto a Shinra boat that was headed for Junon. Here he was confronted by Cloud and his party who also snuck aboard. Cloud demanded answers from Sephiroth. But Sephiroth, having more important matters to attend to, fled leaving JENOVA to fight the heroes. Back in Nibelheim, which had been rebuilt by Shinra to cover up the incident five years prior, Sephiroth found his way to the basement of the Shinra mansion. Here, he awaited Cloud’s arrival, asking him if he would join the “Reunion”. Sephiroth quickly realizes Cloud isn’t ready yet, and tells Cloud to follow him North past Mt. Nibel. He then proceeds to fly away after tossing a Destruct Materia at Cloud. Afterwards, he heads for the Temple of the Ancients in search of the Black Materia, an ancient Materia which when used summons a great calamity known as Meteor. Upon arriving, he encountered the Turk’s leader, Tseng, who had already released the seal of the temple with the Keystone that Shinra stole from Cloud’s company. When asked, Sephiroth partially explained his motives to “absorb all the planet’s knowledge and wisdom” and “become one with the planet”. He then attacks Tseng, leaving him wounded for Cloud and the others to find. The heroes, after speaking with Tseng, journey deep into the temple where they confront Sephiroth again. He further explains his plans to summon Meteor in order to wound the planet. Once the planet is wounded, it will gather immense amounts of energy to try and heal the wound. And when all the energy gathers, Sephiroth will be there to absorb it all effectively becoming a God. He then pretends to run once again, but instead waits for Cloud to collect the Black Materia for him and then controls Cloud’s mind to get him to hand it over. Afterwards, he vanished, only to reappear at the Forgotten Capital where Aerith, the last true Cetra, was attempting to use the White Materia to summon the only force capable of stopping Meteor, Holy. He killed her to taint the summoning of Holy so he could repress it with his willpower. After toying with Cloud’s delicate mind, he leaves while JENOVA fights the heroes again. He then continues North towards the Northern Crater where he intends to summon Meteor. However, Cloud and the others catch up to him, defeat JENOVA who they had been chasing the entire time, took the Black Materia back, and split up. One party stayed behind with the Black Materia, the others went on ahead to confront the real Sephiroth. Sephiroth, who had been reassimilating his body at the Northern Crater the entire game, used his powers to get the Black Materia back to Cloud and forced him to give it to him directly. He then continued to summon Meteor, erecting a barrier around the Northern Crater to keep everybody out. However, Shinra managed to blast through the barrier with the Sister Ray cannon. This allowed the heroes to enter the Crater once more and try to stop Sephiroth once and for all. But, The Landlord brought Sephiroth to Domus Facina before Cloud could reach him. Sephiroth is the author's favorite Final Fantasy character, and thus has received a minimal amount of special treatment thus far. His first appearance was during Xande's intro, making a non-sequitur appearance to let the readers know Xande is lying about his claims. In his official intro, he is personally introduced by the Landlord, who acts all giddy around him before being dismissed. He is next seen hitting on Ultimecia, and it is made clear how much the other residents do not like him. Sephiroth was the first character to star in his own Saga, titled Sephiroth's Milk Saga. Sephiroth showed in his introduction that he carries JENOVA's head around with him even now. He either has a telepathic link with her conscious, or is just insane, as he states she greeted the audience. He has half a pack of Skittles and a pocket protector in his inventory. Really.